For those who are wondering what is happening with the Yahoo-Bing deal, here’s an update. This is a complete switch: the Yahoo syntax no longer works and the Bing syntax does. At this point, Yahoo in the UK, Yahoo in Russia and Yahoo in many other countries are still powered by the Yahoo algorithm. Many (if not all) US folks already see the Bing search results when we use Yahoo.com. 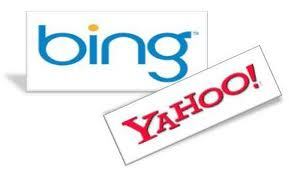 To check which algorithm “your” Yahoo uses, try searching in Bing in parallel and compare the results. Or, take a look at the very bottom of the Yahoo search page and see whether it says “powered by Bing” in very small letters. By the way the operator linkdomain, used alone, still works on Yahoo.com, forwarding us to its “site explorer“.